This morning started off even earlier than usual for me. I'm used to being at work by 7am, so I agreed to scheduling my MRI this morning at 7:30. They said to be there at 7 so I left extra early worried I'd somehow be late. Granted there was zero traffic at 6:40 am, and it was only 10 mins away. But, being there extra early paid off. They sent me straight back, no waiting. What??? No waiting? I was shocked. The MRI only took 15 minutes (and thankfully it was just my legs in the tube) so I was at work by 7:30, only 30 minutes later than usual. I'll call that the big win of the day. Sometimes it does indeed pay to be early. As for workouts, today was leg day for me. I flirted with the idea of doing the kettlebell tabata workout again, but my abs are actually sore from the workout, so I thought it'd be smart to hold off on that one another day or two. So, legs it was. I was a little worried about what I could do considering it hurts to put much pressure on my heel. So, I kept the weights the same this week though I was hoping to increase them. As a way to make the exercises (some of them) harder without adding on more weights, I did low-end pulses instead. Talk about a killer burn. I started with about 20 minutes on the elliptical to warm up. I did supersets of 3x8 unless noted. It was a pretty good workout overall. I was a little distracted by one guy who was incredibly loud and would do his power weights (he was just flying through sets) right in front of the racks and sometimes in front of me. Seriously wanted to kick him. And you could tell he really thought he was all that and a bag of chips strutting around and trying to go super heavy with his weights as he was grunting, gritting, and rocking back and forth with so much momentum I thought he'd topple over. I totally wouldn't have helped him up either. When I got home I did as the physical therapist instructed and stretched and rolled out on my Triggerpoint Therapy Kit. She was actually pretty impressed with the idea of the kit. I didn't stretch quite as long as I know I should have, but I did get in a good 20 minutes at least. When it came to dinner, I really wasn't in the mood to cook. I just didn't feel like standing around in the kitchen or trying to be creative for that matter. It's getting towards the end of the week, meaning fresh veggies are disappearing from the fridge at this point. I almost went with veggie burgers, but thought BBQ sounded better. 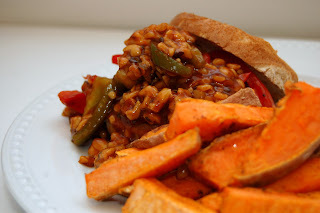 So, I decided to do BBQ Tempeh Sandwiches similar to my BBQ Tempeh & Portobello Sandwiches (just not using portobellos). And what else would I possibly have on the side but sweet potato fries.